In Humphrey T, Parry Sound Dist. on the NW shore of L. Joseph, 31 km SE of Parry Sound. The name was approved by CBGN in 1958. Pop. 35. In Humphrey T, Parry Sound Dist. on Dixon Bay, a NW arm of L. Joseph, 27 km SE of Parry Sound. First called Dixon. Pop. 634. In Freeman T., Muskoka Dist. on C. Rd. 11,40 km. SE of Parry Sound. 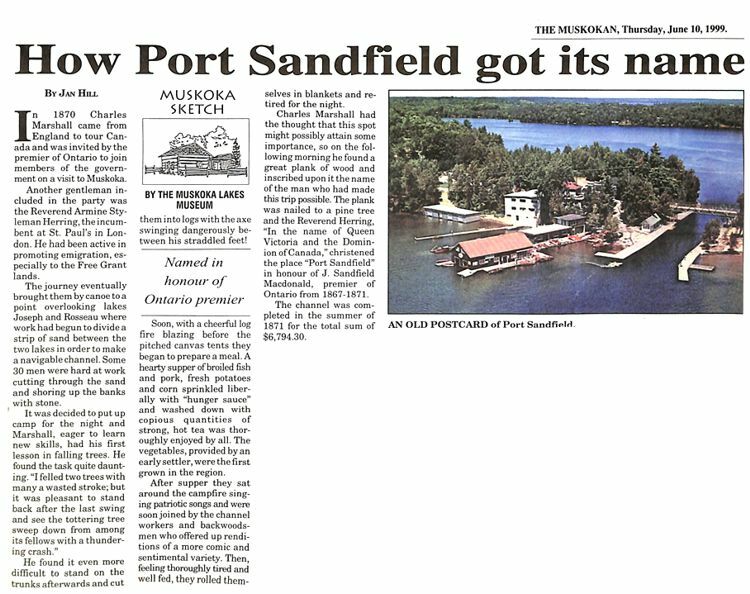 In 1909 the post office was established as Muskoka Station. 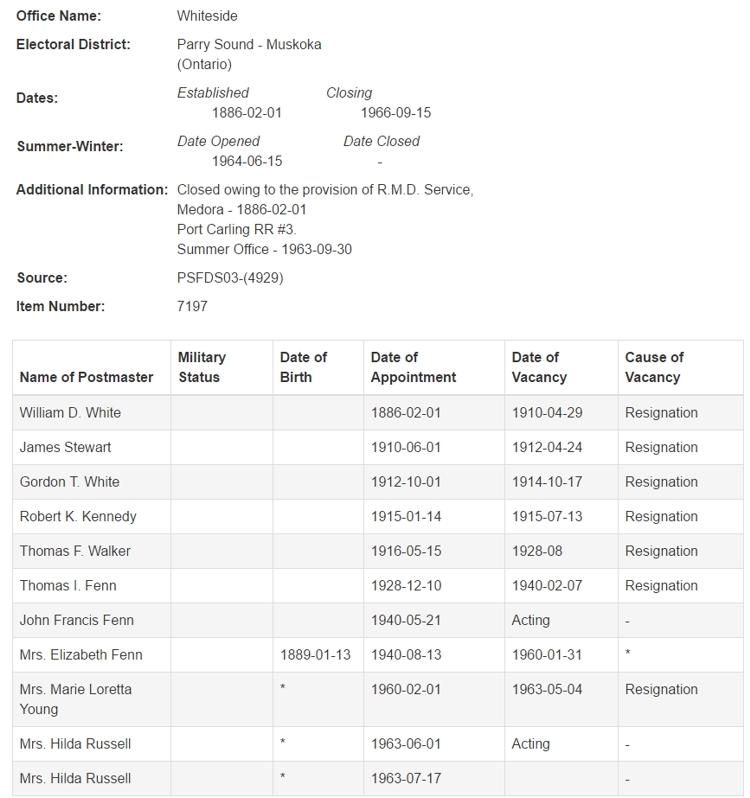 In 1915 its name was changed to MacTier, honouring a senior vice president of the CPR. In Muskoka Lakes T., Dist. 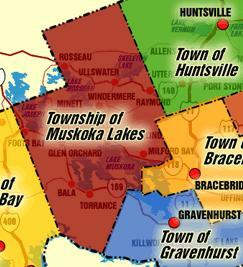 Mun.of Muskoka, N of L. Rosseau, 32 km W of Huntsville. Pop. 120. In Humphrey T, Parry Sound Dist. on HWY 141, 26 km SE of Parry Sound. On an 1881 map the place is shown as Trout Lake. By 1881 the name had changed to Humphrey after the T.
Pop. 139. In Parry Sound Dist., on C. Rd. 518, 21 km E of Parry Sound. In 1879 the place was called Hayford, but it was renamed Edgington a year later by postmaster John Edgington. Pop. 72. In Medora T., Muskoka Dist. on North Bay of Lake Muskoka and C. Rd. 26, 27 km W of Bracebridge. Named for the Eddy Mortimer family which lived here from about 1860. Pop. 43. In Medora T., Muskoka Dist. on L Rosseau and C. Rd. 7, 5 km NW of Port Carling. Named for John Sandfield MacDonald (1812-1872), first premier of Ontario,1867-71. Pop. 87. In Muskoka Lakes T., Dist. Mun. of Muskoka on Hwy. 141,29 km SW of Huntsville. Early settlers here were the Beathunes, Fullertons, Greers, Kingshotts and Youngs. Pop. 129. In Dist. Mun. of Muskoka on the E shore of L. Rosseau, 23 km NW of Bracebridge. The community was named in 1868 after the town of Windermere in England's Lake District. Windermere was incorporated as a village in 1924.